“First Impression is the last impression”… this is not merely a phrase, but a factual statement that defines the persona of any identity. Whether it is a work or a service, everything is being rated by the people. This judgment or ratings regularly help us to raise our abilities’ bar. The answer is- Manufacture the product of being lovable or appraisable by people. Mobile Apps are the best way to dig out that how much your users are appreciating or admiring your services. The prevailing wisdom is that 5 ratings work. That’s why they are everywhere. When you open an app on your Android phone, it asks you to rate it on the Play Store. Complete a ride on Uber, and you have to rate your driver. Order something from Amazon, same story. Open your inbox after a long vacation, and what’s the first email you see? A message from either your airline or hotel, requesting you to rate your experience. Let’s have a look at our daily lives. Weekends!!! Everyone loves to hear this word and have so many planning in his or her mind. Going to a movie is a fantastic idea. What we people do before watching any movie. We check out its ratings on IMDb- “5 Stars or Rotten Tomatoes”. You want a nice restaurant to make your tummy happy, so you check the reviews of restaurants; you find and rate them too after having your meal. Star ratings are a central design feature at the core of many digital items. Ratings are relied on to ensures the quality, derive decision-making, provide feedback and much more. Ratings are also directly impacted on “How we interact with each other” influence the user experience at both ends- giving and receiving services. They form an integrated data set upon which organizations, right from lone-wolf startups to billions of holder companies, base critical business and decisions. How Does Rating Make Sense? I’ll explain, but let’s agree on two facts of Ratings first. Ratings Have An Impact On Services Providers. That is one of the reasons; ratings are everywhere. Drivers on Uber do get blacklisted for low ratings. Top rated hotels on TripAdvisor kind’s sites do get ten times as many bookings as lower rated ones. Ratings always attract users and always leave a curious impact on users that how can the user choose or select an app. As most of the mobile apps are known for their high ratings terminology. How “5 Star Ratings” of an App is mandatory in flourishing Diverse Industries? 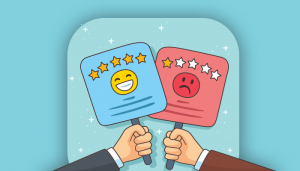 Now lets cover-up some industries that define “How good an app is on the basis of its Ratings.” Users always rely upon the product or the item that is mostly liked by others or rated high on the star board rating. Hence, it is quite mandatory to manage the 5 star ratings to build the trust of the users towards your brand and products. People rate a taxi app like Uber or its services because of the routes driver take, for price fluctuations beyond their control, for slow traffic, for refusing to speed, for talking too much or too little, for failing to perform large tasks unrealistically quickly. Hence, being a taxi mobile app owner, you can’t ditch or offend a customer in any way. Maybe your last customer has given you 5 stars, but a “Single Star” from a single customer could put you out of business. On the way of Taxi-booking app development– along with making, its feature-rich make sure the services you are providing to your customers or the service your users are experiencing is overwhelming. Collect the rivalry Taxi apps reviews and, figure out what are the complaints that users are putting over it and then try to cope up those in your taxi-booking app. People rate Food delivery apps or services on the basis of- how fast services arrive at your doors, for the food being cold when the delivery man delivered it or whether the quantity or quality is compromised somewhere. A single complain or least rating could destroy the reputation of the service provider along with his business. Zomato had faced many negative ratings at that time. 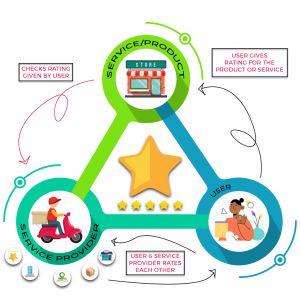 Thinking to appear in the food delivery app development industry with a mind-boggling Food-delivery app then understand the market first and then have a tight eye look over the reviews and ratings and implement all the required features that your rivals are lagging. While your travel app should provide short information about hotels, restaurants, and cafes, but what the users will believe is the ratings and reviews from other users. This feature helps in creating awareness and also helps to better the services of hotels, cafes, and other businesses. If people are rating their stay at any hotel that would be booked via well-known tour & travel managing apps like TripAdvisor, Goibibo, etc., then, their ratings are done on the basis of Cleanliness, quality of Food, and friendliness of Staff. The main reason that made apps like TripAdvisor gain a viral fan following is that of its review system. Therefore, in your travel mobile app, travelers should be able to review a place and share their experiences with other travelers. The Apps are rated because of- how much those apps are flexible to users? To start your mobile app development process for tour & travel apps, then its quite essential to look over the user prospective- data security, flexibility, quality, and availability and introducing these must-have features in your on the upcoming mobile app. Social networking apps are mainly judged on the basis of- how much secrecy and security it is providing, how pleasing UI/UX the mobile app has, how easy the app is in its navigation terms. People generally rate a social media app on the above-mentioned terms. This might could leave an adverse impact on Facebook if the popularity would not up to the mark. Hence, before starting social networking app development– implement all the required safety & security features, which could make your user, rely on or trust your brand and also can refer the respective apps in their circle. Mobile app developers and their brands are experiencing a chicken or the egg persona. Popular apps that top the charts are downloaded the most, but the popularity comes, if the apps are downloaded, to begin with. This means that businesses need to find a medium to become renowned with fewer downloads. Developers go beyond their bar to avail the 5-star ratings and users search the ends of the earth looking for apps that are reviewed well. 5-star ratings seriously boost the download rate as it attracts the users. Contact us to discuss how to attain 5 Star Ratings on Mobile Apps. Send us your query on sales@ripenapps.com.